Chelsea defender David Luiz is reportedly not a particularly popular member of the Blues squad due to a habit of blaming others for his mistakes. The Brazil international is one of the more experienced members of this squad and one that fans and his team-mates alike would hopefully see as a potential leader within this struggling squad. However, Luiz is actually not a uniting figure among Chelsea’s players precisely because he seems to struggle to take responsibility for his mistakes, according to the Telegraph. This is a bit of a worry for CFC fans, with this report generally painting a pretty bleak picture of the personalities in this squad, with a lack of real leaders since the days of club legends like John Terry, Frank Lampard and Didier Drogba. 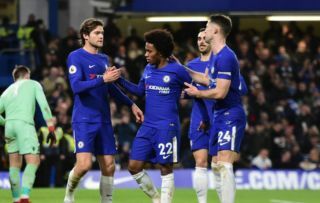 It remains to be seen if this current Chelsea team can really muster up the mental strength to lift itself out of this current slump. Maurizio Sarri’s side have been on an awful run away from home, losing 4-0 to Bournemouth and 6-0 to Manchester City in their last two Premier League games on the road. Luiz was one of the players who looked particularly sloppy in that defeat at Bournemouth.